Heat oven to 350°F. Heat 10-inch skillet over medium-high heat. Add butter and 1 tablespoon oil; heat until butter is melted. Add onion; cook 15 minutes, stirring occasionally. Stir in sugar and 1/8 teaspoon salt; cook 3 to 5 minutes, stirring occasionally, until onion is soft and golden brown. Remove from heat; stir in tomatoes and cheese. Set aside. 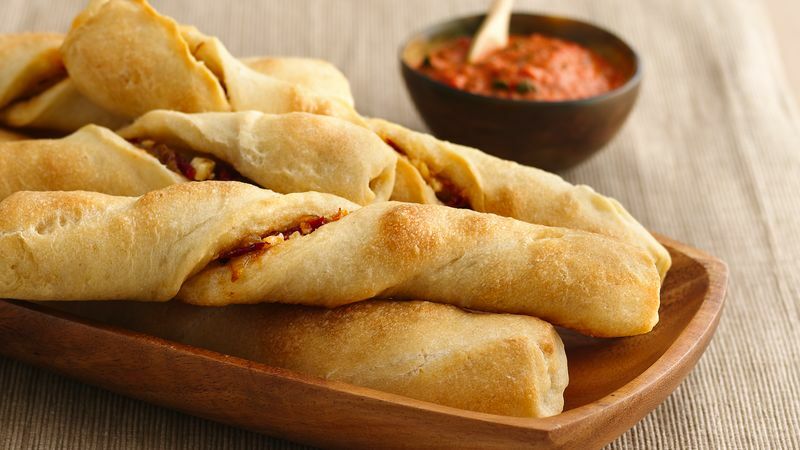 Unroll breadstick dough into 2 sections. Separate breadsticks, leaving pairs of breadsticks together. Spread about 2 teaspoons onion mixture over each pair of breadsticks. For each pair, fold breadsticks together lengthwise; pinch edges of to seal. Twist stuffed breadsticks 3 times; place 1 inch apart on ungreased nonstick cookie sheets. Bake 15 to 20 minutes or until golden brown. Cool 5 minutes. Meanwhile, in food processor or blender, place red peppers, 1/4 teaspoon salt and basil. With food processor running, slowly pour 2 tablespoons oil through feed tube; process until well blended. Serve coulis with warm breadsticks.